Video Visitation Systems | Montgomery Technology, Inc.
2001. We’ve been here the whole time as video visitation developed from a revolutionary idea for inmate and contraband management to a fullfeatured visitation management process to a revenue generation avenue. Video Visitation changes more than any other electronic system in a detention facility. New features, requirements and regulations all push this product to new stages every couple of years. With changes happening so frequently, MTI asked a very important design question: What if video visitation was just a single application within a whole framework of applications? What if those applications were not just limited to what MTI can produce but allowed the facility or service provider to implement independent applications based on existing websites and native apps? With these questions in mind, MTI produced a platform that allows the facility administration and service providers to implement any app they see as necessary for the system. This new platform provides the necessary framework for both web-based HTML5 apps and native apps, all running within a scheduling system that prevents apps from running against each other, all while managing each inmate’s access rights. The MTI Video Visitation System consists of basic components: the devices and the Connex.us app. – This device is a non-touch device with a LCD screen protected by a 3/8” LEXAN. The device can implement apps such as advertisements and video visitation, but human interaction is limited due to the lack of a human-machine-interface such as a touchscreen. 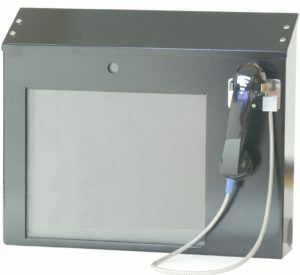 This device is useful where video visitation is the primary interest and a more secure device is needed. – This device is a touch-enabled device with a LCD touchscreen. 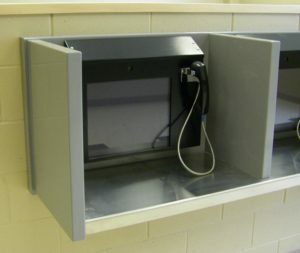 This device is useful for providing inmate interaction. The facility can use the device to implement apps such as commissary order entry, grievances, inmate handbooks, inmate calendaring, newspapers, messaging, video visitation, telephony, and so on. 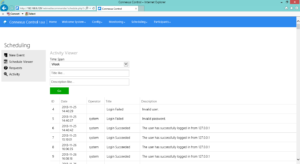 – This device mobilizes the 91541 or 91542 so it can be used in multiple locations. The unit is mounted to a mobile platform that is both ergonomic and sturdy. from 7 PM to 10 PM. This, along with any number of other variations, is possible with the Connexus app and the MTI Libertas Framework. – The facility staff is never without full control of visitation, from anywhere on the planet. The MTI Connex.us Control web portal is a browser-based, secure interface that staff can use to schedule visits, monitor active visits, manage participants, and review call history. – This website provides a single point of interface and information for friends and family who are looking to schedule visits with an inmate or participate in a From-Home visit. From the site, visitors can schedule a visit with any available facility, download and install necessary software for participating in a from-home visit, or purchase prepaid calling codes for discounted visitation.